The Hotline slot machine from NetEnt pays homage to those late-night, American cop dramas of the 1970s and 80s. There’s also a kind of Grand Theft Auto feel about the whole package too. It’s a great theme for a slot machine, for sure. Let’s take a look to see if the gameplay matches the great look and feel of the title, shall we? Action packed introduction paying homage to cop dramas from the 1970s and 80s. The animations continue in the game itself too. Great music. Gives the game a feel of those late-night police dramas. Strong artwork that is in keeping with the overall theme. Massive return-to-player rating. At over 97% it’s one of the largest we’ve seen. However, it’s not made clear which of the Hotlines features need to be active to achieve this huge RTP. We’re really not keen on games that require players wager more to see all the special features. The Hotline feature is an example where this is the case. The lack of a true second screen bonus feels like a wasted opportunity. The subject matter lends itself perfectly to a high-speed chase round or similar. Kitty Weiss = 200x the line bet. Rivera =120x the line bet. Quinn = 80x the line bet. 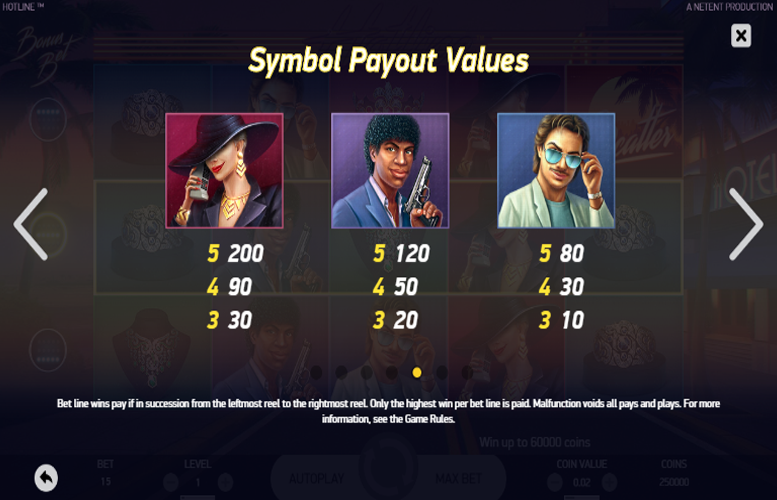 Hotline Bonus Bet is a bonus bet feature that increases the chances of winning Expanding “Wilds” and Re-Spins for a higher bet. When one Hotline is activated, the game is played with Base Bet (15 coins per bet level). If two Hotlines are activated, the game is played with Double Bet (30 coins per bet level). If three Hotlines are activated, the game is played with Triple Bet (45 coins per bet level). 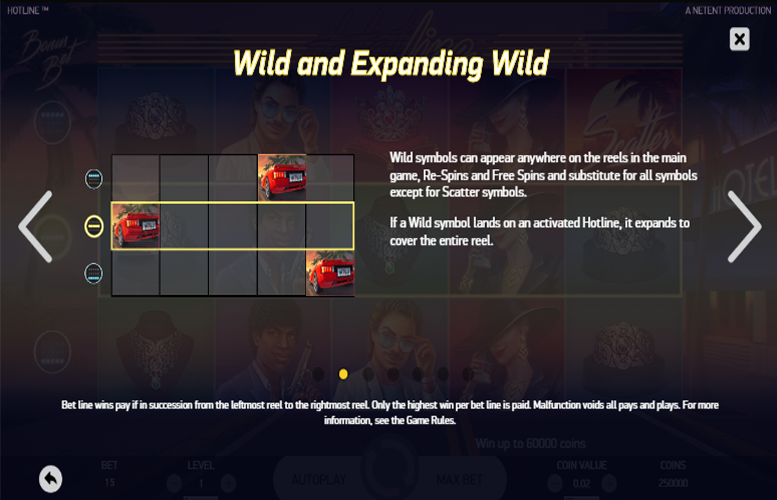 “Wild” symbols can appear anywhere on the reels in the main game, Re-Spins, and Free Spins. They will substitute for all symbols except for “Scatter” symbols. 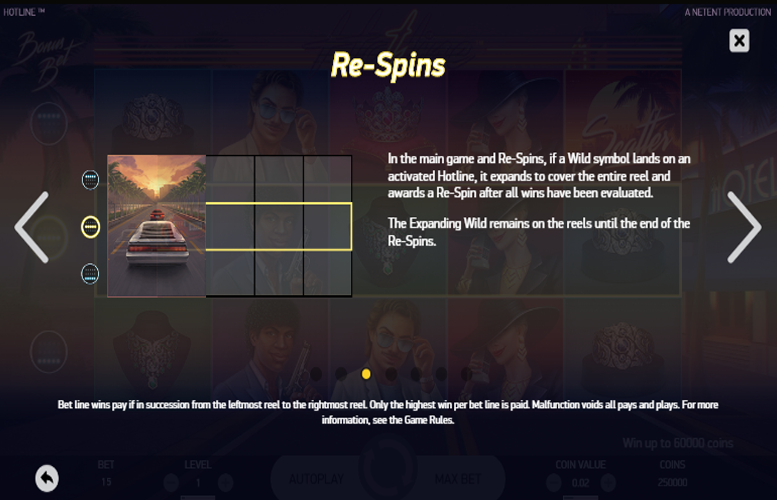 In the main game and Re-Spins, if a “Wild” symbol lands on an activated Hotline, it expands to cover the entire reel and awards a Re-Spin after all wins have been awarded. The expanding “Wild” remains on the reels until the end of the Re-Spins. 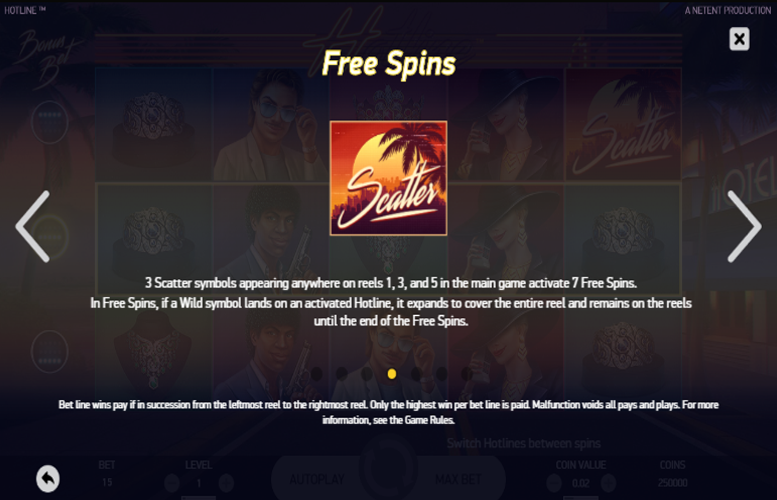 Landing three “Scatter” symbols anywhere on reels one, three, and five simultaneously during the main game will activate seven free spins. 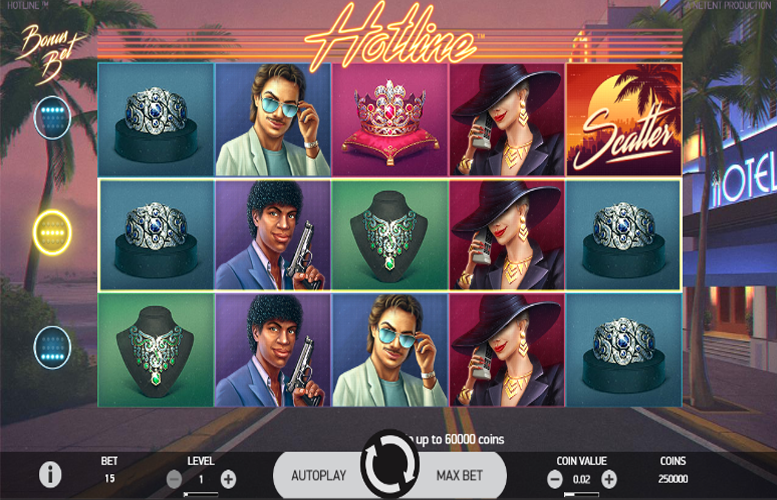 In the Free Spins mode, if a “Wild” symbol lands on an activated Hotline, it expands to cover the entire reel and remains on the reels until the end of the Free Spins. Red crown = 30x the line bet. Green necklace = 25x the line bet. Blue ring = 20x the line bet. The Betting Limits on the Hotline slot machine are a little different that we’re used to thanks to the Hotline feature itself. 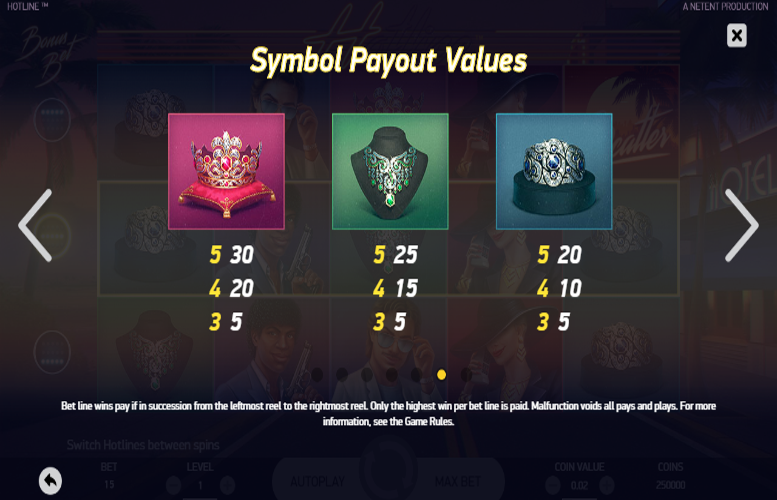 Firstly, players can adjust the value of each coin bet on the game. Here, it’s possible to choose various integers between 1p and £1. They can also choose the level they want to bet. These can be any number between one and 10. Here’s where it gets a little different. Since the machine has a total of 30 win lines, you’d expect for the lowest possible bet to be 30p and the highest to be £300. This isn’t the case, however. The lowest possible bet per spin is played with only one Hotline active. This costs 15p per spin. Meanwhile, with three Hotlines active and all values maxed out, the maximum bet per spin is £450. For more information, see the section on the Hotline feature of this review. All told, the Hotline slot machine will likely excite many folks, and some just won’t get it. I personally fall into the latter category. It’s hard to love a game with such silly betting limits that restricts some gameplay features (and potentially RTP rating) to those betting the maximum per level. This game has a rating of 3 / 5 with 276 total reviews by the users.